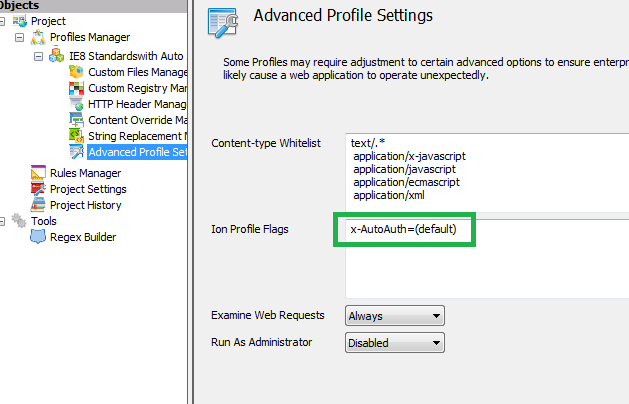 I set up a Browsium rule recently to render a SharePoint 2010 site in IE8 Standards mode. Without the Browsium rule in place the site loaded fine but one of the Web Parts didn’t work. However when the Browsium rule was enabled, the Web Part worked fine but the user was prompted for authentication when the site initially loaded! It was as if Browsium wasn’t passing the Windows authenticated credentials during the request. To resolve the authentication issue we can specify an ION profile flag under Advanced Profile Set which details what credentials are sent to the upstream server when automatically replying to an authentication challenge.